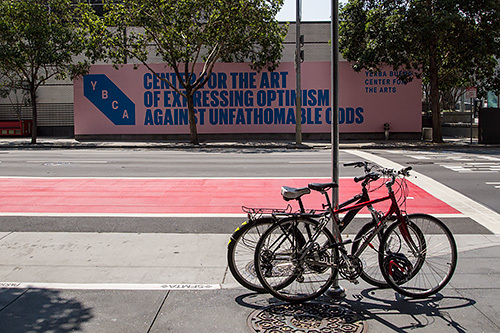 We happened across this sign advertising the Yerba Buena Center for the Arts earlier this week walking to an appointment. We smiled and kept walking. Then we stopped, turned around and walked back, picking a spot directly across from it and back from the sidewalk and the steady stream of foot traffic. YBCA. Center for the art of expressing optimism against unfathomable odds. We looked at it a bit. Sure, the sentiment was bracing, but the environment had something to say about the subject, too. Those two bikes chained to a street sign, for example. It's gotten to the point here that we locals have to warn friends and visitors (even complete strangers) not to leave anything visible in their car when they park it. And it almost goes without saying that you should never leave a bike on the street, even chained. What mad optimism cajoled these two bike riders to leave their trusty steeds on the street with nothing more than a linked chain to hold them until their return? Cars will be broken into, their contents repurposed. Bikes will be spirited off, taken apart, their serial numbers filed off and reassembled for resale. What mad optimism cajoled these two bike riders to leave their trusty steeds on the street with nothing more than a linked chain to hold them until their return? And yet they did. Then there's the street itself. That's a crosswalk to the right, protected (in the loosest sense) by a street light. There's a lot of traffic here. But when we first spied the sign, no cars blocked our view. As we stood off the sidewalk a bit, there was never a break in the traffic. So we took a few shots with cars in them. Until, once again, the wave of traffic broke and we got a clean shot. But did we want a clean shot? Shouldn't we include the traffic, the chaos, the drama? We thought about it as we decided which image to edit. Sure, we could include the cars. They're part of the Unfathomable Odds, after all. A counterpoint to the bikes, which represent Optimism. But we must have seen too many Wile E. Coyote and the Roadrunner cartoons as a kid. An empty road is just a stampede of vehicles waiting to happen. That is the drama. Besides, you couldn't read the sign if there were cars there.